If you’re wild about bears, you’ll probably be wild about this book. 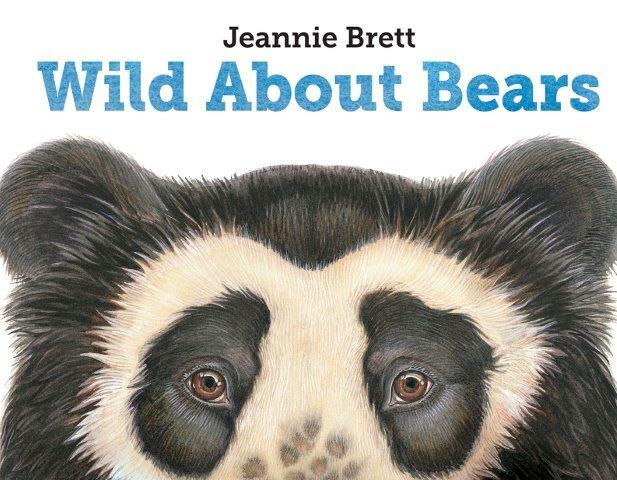 Author Jeannie Brett shows us the eight different kinds of bears on the planet: Black bears, Brown bears, Polar bears, Spectacled bears, Pandas, Sun bears, Sloth bears and Asiatic black bears. She fills us in on the important details: size, scientific name, common names, what they like most in the world to eat, how polar bear paws are adapted to a water world and sloth bear paws adapted to sunbathing in trees…. just the bare necessities. There’s a map in the back in case you want to go on a bear hunt, and websites and books for curious naturalists who want to know more. For some hands-on bear activities, head over to Archimedes Notebook. Young Saruni helps his mother Yeyo sell her goods at a Tanzanian market. In return, she gives him five ten-cent coins and urges him to buy something. He is tempted by roasted peanuts, chapati (fried flat bread), rice cakes, and sambusa (pouch of dough stuffed with meat and vegetables), but what really tempts him is a row of bicycles. Saruni has been acquiring bumps and bruises while trying to learn how to ride his father Murete’s bicycle and he longs to buy his own. Deciding to save his money, Saruni withholds spending his money in the hope of buying a bike one day. 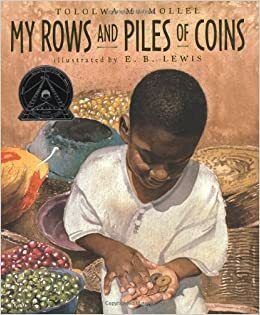 He continues to help his mother at the market and he makes rows and piles of his coins to count them. Soon, Saruni learns to ride his father’s bike and how to carry a load on the bike. He goes back to the market with bundles holding his coins so he can buy a new bike. Unfortunately, the man selling bikes laughs at Saruni because he does not have enough money. Discouraged, he tells Yeyo what happened. What Saruni doesn’t know is a big surprise is awaiting him. We’re teaching an economics unit in our second grade classroom and this book fits it perfectly. Saruni is a model of saving money to reach a goal. It’s also great for teaching arrays as E.B. Lewis’s illustrations show the stacks of coins. My students were counting the money when they saw the pictures. Other economic terms, such as goods and services, also come into play with this book. My Rows and Piles of Coins would be a nice addition to a multiplication unit and/or a unit on economics. 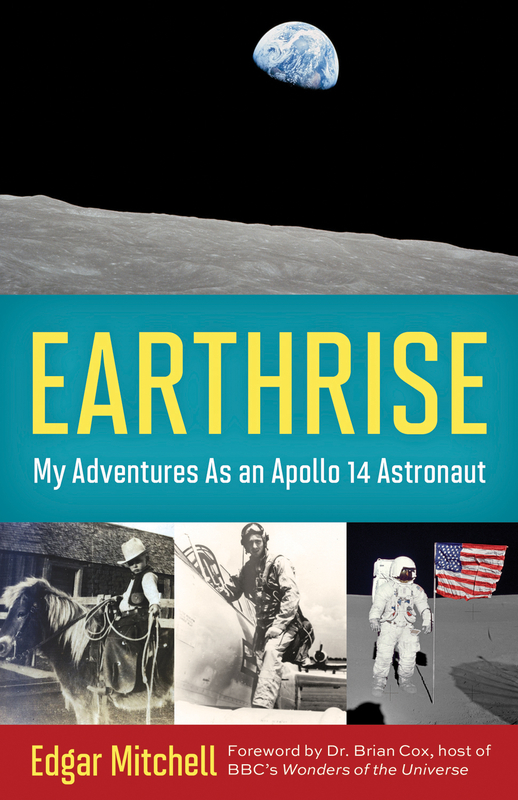 Next week, April 22nd, is Earth Day. But what exactly is Earth Day? What are we meant to do on this day? Isn’t Every Day Earth Day, as the slogan goes? I aim to live my live in concert with my planet, and so I wondered what I should do differently on this day, as opposed to any other day. So, I did the usual. I stopped by the Tompkins County Public Library to troll the shelves for science books. A few weeks ago I wrote about Silent Spring by Rachel Carson. And now, again, I come back to Rachel. In 2003 Amy Ehrlich published a book called Rachel: The Story of Rachel Carson, illustrated by Wendell Minor. This vibrant picture book takes us through Rachel’s life from her early nature explorations, to her biology studies at college, to her continued devotion to having science in her life by the Maine sea. The book is divided into chapters, a page each, with joyful illustrations capturing a moment in Rachel’s life. It includes her writings, and her magnificent Silent Spring, but the focus is Rachel’s life. It is simply written, and yet draws the reader in completely. In 2012, Laurie Lawlor published a book called Rachel Carson and Her Book that Changed the World, illustrated by Laura Beingessner. Oddly, this more recent book is a bit more wordy, but it too tells Rachel’s story with color and clarity. There is more focus on Rachel’s struggles supporting her family, and her place as one of few women working in the sciences. By the end, Lawlor is showing more overtly the challenges and triumphs of Silent Spring. Both books present the essence of Rachel and her work with honesty, and both share the impact that she had on our world. Both also made me fall a little bit more in love with Rachel Carson. She was a woman of her times, yet she defied those times to pursue her passions- nature, science, writing. She did what she had to do to care for her family, to work her way through the publishing world, and to create work that she was proud of, and in the process she ended up changing the world. Earth Day sprouted from the environmental movement that Rachel started. And perhaps it is to the new growths of spring that we should return. Earth Day is a day to plant spinach seeds, to walk in the woods with a child, to petition our government to use less energy, to stand up and defend our planet, defying our times if necessary. Whatever we do on Earth Day, let us look to the bugs, beech trees, rain clouds, and bird-song-filled spring sunshine surrounding us and be grateful for it all. When it gets hot outside, what do you do? Go inside? Sit in the shade? Turn on a fan? Drink cold lemonade? We have lots of different ways of beating the heat – but what do animals do? 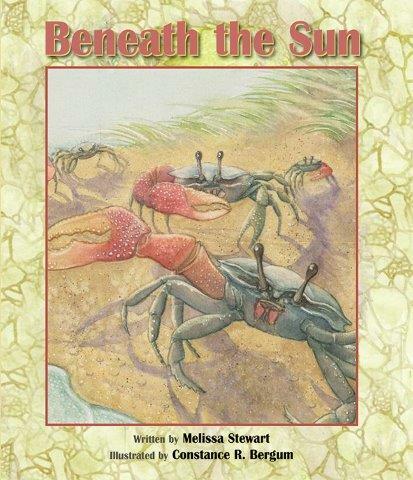 In Beneath the Sun, author Melissa Stewart takes readers into four different habitats for a look at how different animals cool off on hot days. We learn about earthworm loops and horned toad hangouts, cool rocky dens and tide pools. The text is full of vivid verbs, and Constance Bergum’s illustrations beg for closer inspection. Head over to Sally’s Bookshelf for a short interview with Melissa. You can see her video on how she revised her text to make her language come alive with vivid verbs here. “Somewhere in the world right now an animal is lightening its load,” writes Cheryl Bardoe. It could be happening in your backyard, on a farm, in a forest, or on a grassland. Dung beetles, it turns out, are found everywhere on earth – except for Antarctica. And they are very busy workers. They also waste no time locating the dung they depend on to feed themselves and their young. Within seconds of a cow pie plopping to the ground, dung beetles are there. They all want a piece of that pie! Some shape bits of dung into balls that they’ll roll to their nests. Others tunnel beneath the cow pat, filling nesting burrows with yummy dung for their young. And others just dive right into the dung before it dries up. What’s waste to one animal is treasure to the beetles – and they’ll even fight over their share. Bardoe does a wonderful job showing us how dung beetles collect and move their resources, as well as giving us a glimpse of how the young dung beetles grow and develop in the poop-filled nest. 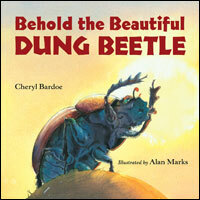 There’s great back matter – including tips on finding dung beetles and some fascinating facts. And the illustrations are great. 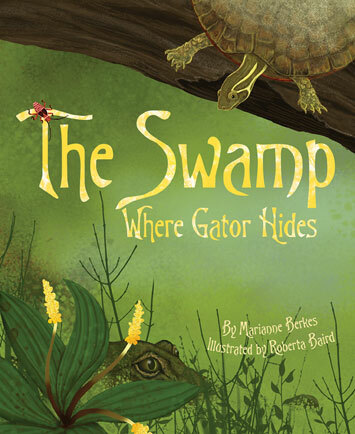 Today is a good day to stay away from the alligator in the swamp. He’s a hungry guy… and if you don’t pay attention, you might just end up as lunch. 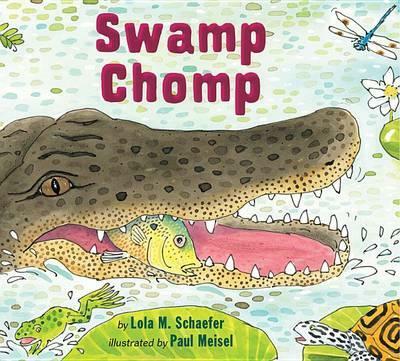 Swamp Chomp is a food-chain romp, filled with lively language as various animals dive and circle and pounce. They slurp and nibble and munch and snap. There’s a handful of Beyond the Book activities over at Sally’s Bookshelf.